The aides were nice enough to have showered Mom before I arrived on Mother’s Day for the annual “tea.” It’s a little party in the dining room off of the lobby with punch, sandwiches and sweets. I have written before about how I feel about Mother’s Day. It is not a favorite of mine, but I have become immune to the ubiquitous marketing and am no longer bothered by it. I am also used to the day being bittersweet. And I am acutely aware that that is the case for many, many people who have either lost their moms, have moms with dementia or otherwise just don’t have much to celebrate on Mother’s Day. At any rate, Mom had been showered and was just being escorted from the changing room by an aide when I got to the program area. And Mom was still feeling the negativity of the experience. She looked good and her hair was fresh. But she had a persistent frown that never did go away. I encouraged her to take a walk with me and we circled the program area, but I couldn’t convince her to come with me down the hall toward the lobby and the party. So I suggested she take a seat and I went to the dining room and got a plate with a slice of cheese, a mini chocolate eclair and a tiny piece of cheesecake. I brought the plate back to Mom in the program area and offered up the treats to her, which she gladly accepted. She had a little trouble transferring the food from the plate to her mouth, perhaps because we weren’t sitting at a table. I was holding the plate, which made things just a little more complicated than when she eats her meals off of the tray placed in front of her at a table. I didn’t eat anything because it was mid-afternoon and we had early reservations at a restaurant with my mother-in-law, who was in town for the start of a two-week getaway – her first since her husband passed away in February. I admit it was nice to have that outing to look forward to since Mom was having a hard time letting go of her bad mood. I tried to walk around with her and distract her, and talked to her as sweetly as I could manage. In the past I have been able to stick it out until her mood shifts. But I wasn’t very successful this time. And I admit it kind of irritated me. Of course, Mom cannot help it. She doesn’t want to be in a bad mood either. Frankly I’m glad this disease often frees her of the lifelong anxiety and fretfulness she endured for so many years. But it wasn’t one of my most patient days. And of course I’m not proud of that. The activities director came around to take pictures of visitors with their resident mothers. She tried to coax a smile out of Mom, to no avail. Then I tried with my own camera. I was unsuccessful, too. Not only would Mom not smile; she also wouldn’t look at me. I lasted only about half an hour. I figured I was potentially an irritant rather than a pacifier on this particular day. I knew Mom wouldn’t be sad to see me go. And I just told myself that next time would be better. On my way out, I chatted with the receptionist, and I said Mom was in a bad mood. “Bonnie in a bad mood. Imagine that,” she said, joking. Mom does have a reputation for getting the grumps, especially when it comes to any type of hygiene or instructional activity. But she is also often easygoing. This receptionist is also on the activities staff, so she has known Mom for a long time and she likes to kid with me about Mom’s quirks. I think she’s of the mind that if we don’t laugh, we might never stop crying. Her husband died of dementia. I just returned from a week away with Patrick and my mother-in-law, the second half of Patrick’s mom’s getaway after she spent a week with her sister not far from us in Ohio. It was a relaxing, peaceful week at our favorite spot in North Carolina. And it’s a reminder that not only do I have a loving mother-in-law, but I also have a very supportive stepmother; this Mother’s Day coincided with Dad and Pat’s 40th wedding anniversary, so she has been a positive force in my life since I was just a little kid. When I’m feeling gloomy about Mom, I remind myself of this good fortune. I did get one call from the Alz center while I was out of town. A nurse called to inform me that Mom was going to be mildly sedated for an upcoming dental appointment. I was very supportive of the idea. She would just receive a pill about 15 minutes before the appointment. Staff hoped she’d relax enough to let the dentist not only get a good look at Mom’s mouth, but also perform a decent cleaning. I look forward to hearing a report about how it went. The nurse also said aides had requested that I bring in some extra strong deodorant because whatever the Alz center supplies is not effective enough to prevent Mom’s body odor between showers. Mom is going on four years in this place and I have never heard this complaint. But I’m happy to accommodate their request. 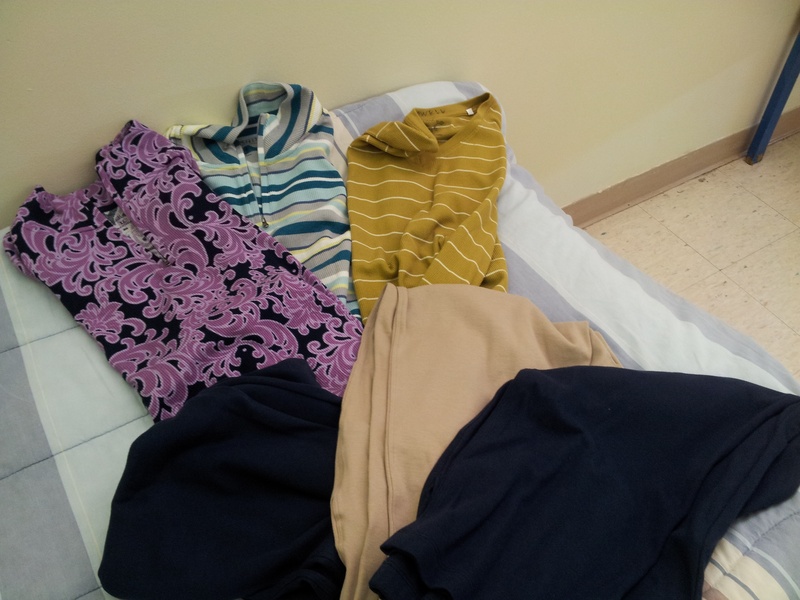 A few visits ago, an aide at the Alz center asked me to bring Mom some new clothes. She took me to Mom’s room and opened the closet, pointing to the kinds of shirts that aren’t so great – blouses with buttons – and those that work the best – short- or long-sleeved pullovers. The presence of buttons, the aide explained, seems to encourage Mom to open her shirt when she is hot. She needed some more pants, too. Everything should be as easy as possible to put on and take off. I never would have guessed that I would ever need to buy Mom clothes again. We filled a walk-in closet with her wardrobe when she moved to assisted living, and we pared down the supply when she moved to the nursing home – but she still had plenty of different shirts and pants to wear, for all seasons. But she is messy, so her clothes are laundered frequently. They are wearing out. Some, undoubtedly, get lost, even if her name is written on them. So I went to Kohl’s recently to buy some new sheet sets, and scanned the clearance racks for potential shirts for Mom. I found three colorful pullovers that could be worn in any season, really. Long sleeves, but a fairly light cotton fabric. A waffle weave, so they have a little bit of bulk. Mom and virtually ever other woman at the Alz center is braless at this point in her life, so I like Mom’s shirts to at least provide some decent cover to her naked chest. I found three pairs of elastic-waist cotton pants in the petite department. Mom used to be taller than I am, but she is shorter than me now. And it’s just as well if her pants are too short so there is no risk that she will trip over them. I like the colors in the shirts. By god, if I’ve got to buy Mom clothes at this point in her life, I’m going to buy clothes that make her stand out in a crowd. I breezed in last Friday morning to drop off the clothes. My support-group friend was there. His wife was napping. I visited him briefly, but I was antsy about getting to work. His wife came out of her room and asked, “Where’s D?” And he said, “I’m right here.” “Where’s D?” she asked. He put his arm around her. “I’m always right here,” he said. “Where’s my family?” she asked. I patted her arm and said she should give herself a chance to wake up, that she was still out of it. 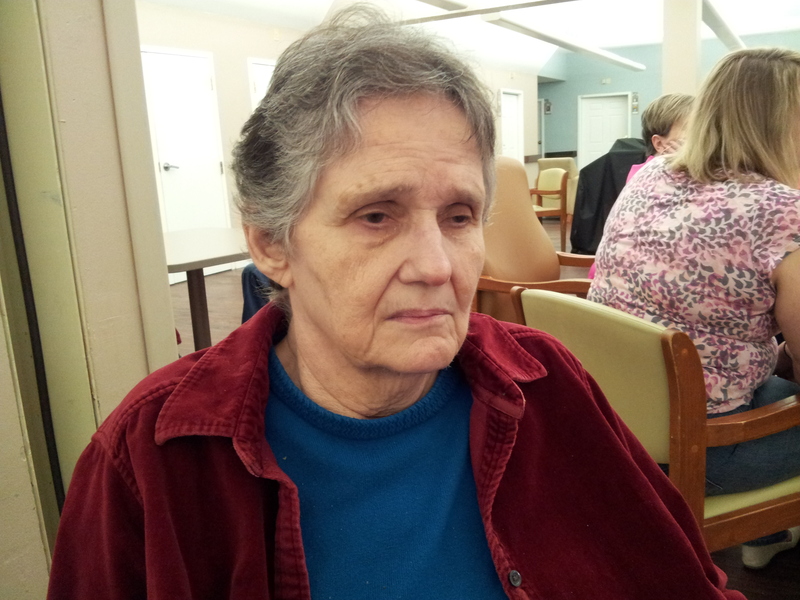 To him, I said, I think it’s a good thing that she lives here at the Alz center now. I don’t think he needs to be convinced anymore. I think being at home with her was hard, and seeing her change in this new setting is hard. Mom was drowsy when I stopped in, and was lying on a couch. I bent down to talk to her and she sat up and just started chatting away. She was very cheerful. I told her she had some new outfits to look forward to. I hope everything fits, and doesn’t get lost. Though if I have to buy her even more clothes, that would certainly be OK.